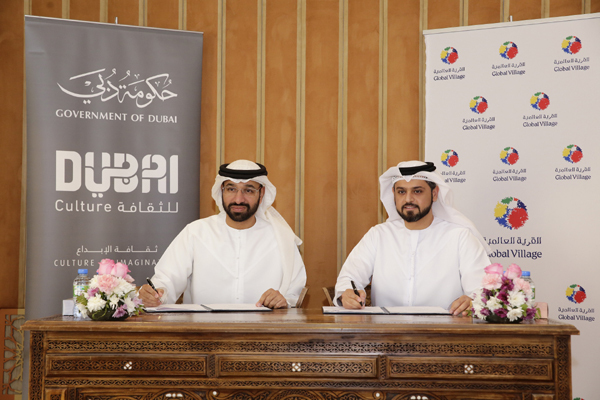 Dubai Culture & Arts Authority (Dubai Culture) has signed a memorandum of understating (MoU) with Global Village for the hosting of the ninth edition of the ‘Live Our Heritage’ ‘festival. The agreement was signed by Saeed Al Nabouda, acting director general at Dubai Culture, and Bader Anwahi, CEO of Global Village. As part of the agreement, Dubai Culture will hold the ninth festival in its biggest and most comprehensive version, at Global Village for more than five months with the aim to promote UAE national heritage among all segments of society — citizens, residents and tourists — in order to preserve and strengthen UAE values and traditions and transfer them to future generations. “We, at Global Village, are always keen to present our Emirati culture with all its rich heritage and to present it in a way that reflects its authenticity to the millions of our guests from residents and tourists. We believe that our strategic collaboration with Dubai Culture & Arts Authority for hosting the “Live Our Heritage Festival” at Global Village will provide our guests with a comprehensive overview of the most important traditional handicrafts, as well as highlight our traditions handed down through generations with interactive workshops and festive events. This season, as one of the most distinctive Emirati brands that celebrate world cultures, we are offering a series of diverse cultural events with an innovative touch that reflects both the present and the authenticity of the past as part of our celebrations for the Year of Zayed,” said Bader Anwahi, CEO of Global Village. Dubai Culture celebrates traditional handicrafts as products of a civilization and as inspiring means of expressing a culture’s originality. Handicrafts are an authentic component of UAE life and history, and the Authority is committed to preserving and developing them to strengthen national identity and provide UAE citizens and residents with a distinctive source of pride in their own culture.